In any area of life, you don’t want to suffer from leakage. But in the context of climate change policy, leakage refers to industry moving from highly regulated jurisdictions to lightly regulated ones. Therefore if (say) Western governments impose strict limits of carbon dioxide emissions, total worldwide emissions will not drop as much as originally expected, because firms might move to China or India. A new study from the OECD seeks to dispel worries over regulations causing manufacturers to outsource, but actually the paper doesn’t prove what its supporters are claiming. The paper’s own results are consistent with environmental regulations making a country poorer while doing little to reduce global emissions. As we will demonstrate in the next section, the crucial part I’ve put in bold—where the authors bring up the obvious worry that outsourcing will render environmental policies pointless—is literally never addressed in the rest of the study. They explicitly say that such an issue lies outside its scope. Beyond that, even the rest of their results—in which they claim that the volume of trade is not significantly impaired, only its composition—are consistent with the analysis of critics who claim that unnecessarily strict environmental regulations hurt domestic industries and make a country poorer. I will explain why this is so later in the article, with a simple example. But first let’s look at the problem of leakage. If the purpose of environmental regulations is to reduce global carbon dioxide emissions, then it is crucial to know how much a crackdown by, say, the United States will cause carbon-intensive operations to outsource to places like China. In this scenario, it would appear that the US policy was working—measured emissions from US sources would indeed decline after a stricter policy is imposed. However, if the policy change made emissions from China spike more than otherwise would have occurred, then the net impact of global emissions is unclear. Furthermore, to the extent that industrial operations in China tend to be more “profligate” with their emissions, the implications could be bigger than the level of outsourcing might indicate. In other words, even if only a fraction of American operations moved to China in response to, say, a stiff carbon tax, the fact that these operations would now (in China) emit more tons of carbon dioxide for a given dollar-level of production, would magnify the ultimate addition to global emissions. For a specific example that I’m making up with nice round numbers, suppose the US imposes a high carbon tax and, as a result, 15 percent of carbon-intensive producers move their operations to China over time. But, further suppose that once in China, these operations emit twice as much CO2 for every unit of output (and keep in mind that goods now have to be shipped across the ocean to America). In that case, it would be as if 30 percent of US producers moved to China, meaning the impact on global emission reductions would only be 70 percent of what a static analysis would’ve suggested. Wonks in the US, running cost-benefit calculations on the new carbon tax, might seriously overestimate the “climate benefits” of the new policy, even if we stipulate their value of the “social cost of carbon” for the sake of argument. Thus we see that the authors of the OECD study do not even attempt to quantify how much the impact of trade disruptions caused by new environmental policies could possibly reduce the benefits of those policies. In the following sections, we’ll see that their efforts to downplay the costs of those policies is also dubious. The quick answer is that the authors run an econometric model and conclude that the impact of stringent environmental regulations in Western countries (for which they use Germany, Switzerland, and Denmark as proxies) can only explain a small fraction of the changes in trade flows between them and the BRIICS countries, if we focus on the “value added” domestically in the trade figures. (“BRIICS” is an acronym for Brazil, Russia, India, Indonesia, China, and South Africa.) Furthermore, they argue that the impacts don’t affect the overall level of trade, but merely its composition. Specifically, if a Western nation imposes a stringent environmental policy, then exports from its energy-intensive industries goes down, while exports from less vulnerable sectors go up. The opposite is true for BRIICS countries—they see a boost to the exports from their energy-intensive sectors, and a drop from the others. There are two main problems with this purported dismissal of the possible problems of environmental regulation. First, econometric models can generate all kinds of results, depending on how they’re set up. I’m not accusing the study authors of deception, I’m merely saying that these approaches are still an art more than a science. SOURCE: OECD study, p. 15. In the figure above, the dark colors represent exports (either in gross or in “value added domestically” terms) from sectors that they call “dirty,” by which they mean rely heavily on emissions (either of conventional air pollutants or carbon dioxide). The light colors represent exports from “clean” sectors by which the authors mean sectors that cause very little emissions and hence are relatively immune from environmental regulations in this realm. The medium-shaded colors represent sectors that fall in the middle of this range. The countries are classified into three different categories: On the left, BRIICS (which remember includes Brazil, Russian, India, Indonesia, China, and South Africa), which are considered to be relatively lax in environmental regulations. In the middle are the countries on their scale that score low on Environmental Policy Stringency. Finally, on the right are the group of countries that score high on Environmental Policy Stringency. Finally, the authors tell us elsewhere in the study that the “value added” component of global trade is the most relevant, since that shows goods that are exported which were produced domestically. In other words, we want to focus on exports from goods that were made in factories in the country, not simply inputs that were produced elsewhere and then flowed through the country on the way to their final destination. 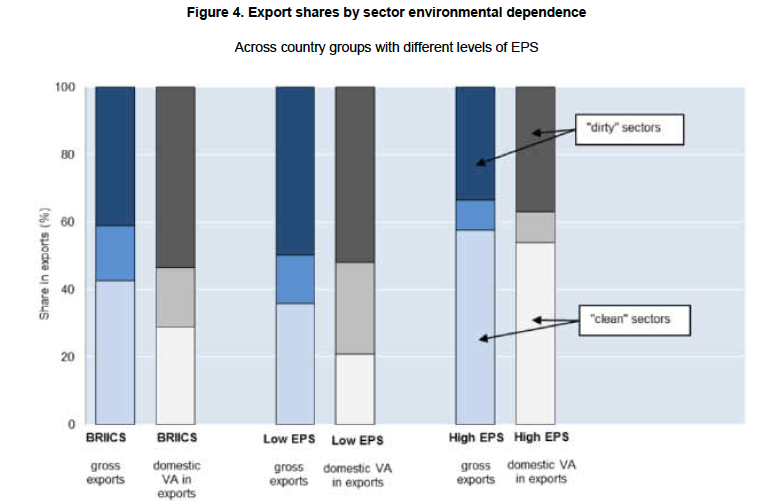 As the figure above makes clear, there is a huge difference in the value-added export flows from the “clean” vs. “dirty” sectors, depending on whether we are looking at the BRIICS or low EPS country categories, or the high EPS countries. For one specific example, look at the white bar in the middle strip versus the far right. In the middle, it shows that countries with low environmental policy stringency have only about 20 percent of their domestically-produced export value coming from non-energy-intensive (i.e. “clean”) sectors. In contrast, the far right bar shows that countries with strict environmental regulations have a little more than 50 percent of their domestically value-added exports coming from such “clean” sectors. That’s an enormous result, so let me repeat it: In the actual data on real-world exports of products created domestically—in other words, not in a regression that could wash away these raw facts as being due to other variables—we see that countries with stringent environmental regulations see non-energy-intensive products accounting for some two-and-half times the proportion of their domestically produced total export volume, compared to countries with lax environmental regulations. Notwithstanding the authors’ econometric model, I think further study is necessary to make sure this huge result in the actual observed data really has little to do with environmental regulations and their impact on international competitiveness, as the authors maintain. Finally, let us deal with one other problem in the OECD argument. They emphasize the fact that yes, it’s true that certain energy-intensive sectors might be hurt by stricter environmental regulations, and will find themselves unable to compete internationally with firms operating in countries with lighter regulations. However, the OECD authors argue, the shrinkage of exports from these energy-intensive sectors can be partially or even fully offset by growth in exports from the so-called “clean” sectors. So overall, the country isn’t hurt in terms of competitiveness, as the critics allege. In this (absurd) scenario, what would happen? Would every American starve to death? No. What would happen is that most American farmers would cease operations. The price of food in the US would begin rising rapidly. Grocery stores would turn to foreign producers to replace their American suppliers, who were now out of business. Compared to the previous year, the US would begin importing massive quantities of food from the rest of the world. When the dust settled, the Americans who had previously been employed in agriculture would have shifted into other sectors. Gross imports of food into the country would have skyrocketed, while domestically value-added exports of other goods from the US would have also skyrocketed in order to make the trade accounting work. In other words, the US would need to “pay for” the food that the other countries were now sending it, and it would do that by having Americans produce more jet engines, software programs, financial services, vacations in Disneyworld (which show up an “export” when someone from abroad visits Florida), and so on. Now if the OECD authors studied this ridiculous situation, they might conclude that fears of the US food ban were overblown. After all, there was no long-term impact on employment; workers just shifted industries. Furthermore, total trade was actually enhanced as the US focused on non-agricultural exports in order to pay for the huge influx of new food imports. So what’s the big deal? But of course such a conclusion would be nonsense. It would be disastrous if the US government made it illegal to grow food in the United States. Yes, global production would eventually adjust to the new situation, but productive US farmland would be devoted to (say) office buildings when it really made more sense to grow wheat on those acres. Before the absurd government proclamation, market forces located agriculture where it made the most sense, and so in the aftermath of the new policy it is more expensive to produce a given bushel of wheat or corn, because they now have to be produced on relatively inferior farmland elsewhere in the world. Even though everybody would eventually find a job once wages and prices had adjusted, Americans would find that they had a much lower standard of living than before. They would still be able to obtain food at the grocery store, but it would be much more expensive than before, and so they could only afford less of it. Furthermore, the much weaker dollar would make previously imported goods (such as electronics goods and apparel) more expensive. Leaving our analogy and returning to the OECD study: The mere fact that stringent environmental regulations don’t reduce total trade volume, but merely affect the composition, doesn’t tell us anything about the possible harm of the regulations. The OECD result is perfectly consistent with such regulations raising the price of energy and causing genuine harm to households and firms, as global production is now forced into a less efficient structure. A new OECD study purports to show that stringent environmental regulations won’t hurt international competitiveness as the critics allege. The implicit conclusion is that these regulations are therefore a good idea. However, the study doesn’t even attempt to assess the effect “leakage” has on total global emissions, which (in the case of climate change) is the whole point of the regulations. So we have no idea what the ostensible benefits of the regulations will be. On the other hand, the study doesn’t even attempt to assess the true cost of the regulations in terms of reduced economic output. The study estimates changes in the composition of trade flows, but even if we accept their results, there could still be a significant impact on standards of living. Finally, we should be cautious before accepting the study estimates, because the raw figures show that countries with strict environmental regulations have a significantly smaller share of energy-intensive exports than other countries, suggesting that these policies may be much more potent than the OECD model reports.